WOOSTER, OHIO — To understand ancient life a paleontology student must also know a considerable amount about modern life. 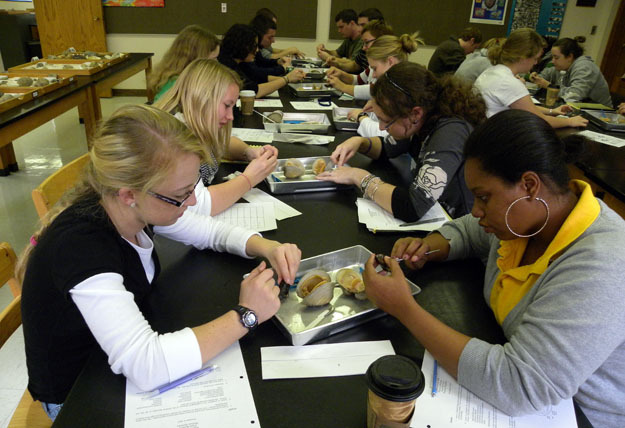 In our Invertebrate Paleontology course this means that students study, for example, modern clams to provide a context for the fossil clams they are interpreting. In the above image the class today is dissecting modern infaunal clams (Mercenaria mercenaria) and mussels (Mytilus edulis). I buy them at the local grocery store so that they are fresh and with no preservatives. That means there are always challenges opening them — and always a mushy mess afterwards! It is worth it, though, to sort out the anatomy of these bivalves and match their soft parts to the hard parts we find in the fossil record. It is also a reminder that the stony fossil we study today once had its gooey living moment!